Published for ABMP members by Associated Bodywork & Massage Professionals. 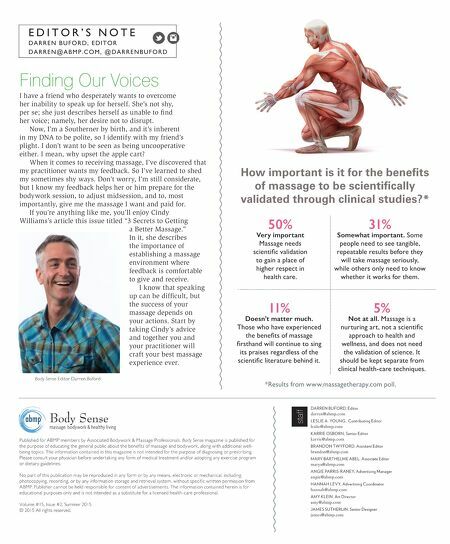 Body Sense magazine is published for the purpose of educating the general public about the benefits of massage and bodywork, along with additional well- being topics. The information contained in this magazine is not intended for the purpose of diagnosing or prescribing. Please consult your physician before under taking any form of medical treatment and/or adopting any exercise program or dietary guidelines. No par t of this publication may be reproduced in any form or by any means, electronic or mechanical, including photocopying, recording, or by any information storage and retrieval system, without specific written permission from ABMP. Publisher cannot be held responsible for content of adver tisements. The information contained herein is for educational purposes only and is not intended as a substitute for a licensed health-care professional. Volume #15, Issue #2, Summer 2015 © 2015 All rights reserved. Body Sense massage, bodywork & healthy living DARREN BUFORD, Editor darren@abmp.com LESLIE A. YOUNG, Contributing Editor leslie@abmp.com K ARRIE OSBORN, Senior Editor karrie@abmp.com BR ANDON TWYFORD, Assistant Editor brandon@abmp.com MARY BARTHELME ABEL, Associate Editor marya@abmp.com ANGIE PARRIS-R ANEY, Advertising Manager angie@abmp.com HANNAH LEVY, Advertising Coordinator hannah@abmp.com AMY KLEIN, Art Director amy@abmp.com JAMES SUTHERLIN, Senior Designer james@abmp.com staff *Results from www.massagetherapy.com poll. 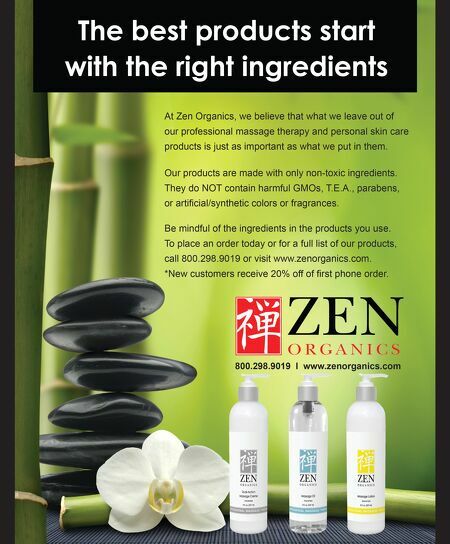 How important is it for the benefits of massage to be scientifically validated through clinical studies? * Finding Our Voices I have a friend who desperately wants to overcome her inability to speak up for herself. She's not shy, per se; she just describes herself as unable to find her voice; namely, her desire not to disrupt. Now, I'm a Southerner by birth, and it's inherent in my DNA to be polite, so I identify with my friend's plight. I don't want to be seen as being uncooperative either. I mean, why upset the apple cart? When it comes to receiving massage, I've discovered that my practitioner wants my feedback. So I've learned to shed my sometimes shy ways. Don't worry, I'm still considerate, but I know my feedback helps her or him prepare for the bodywork session, to adjust midsession, and to, most importantly, give me the massage I want and paid for. If you're anything like me, you'll enjoy Cindy Williams's article this issue titled "3 Secrets to Getting a Better Massage." In it, she describes the importance of establishing a massage environment where feedback is comfortable to give and receive. I know that speaking up can be difficult, but the success of your massage depends on your actions. Start by taking Cindy's advice and together you and your practitioner will craft your best massage experience ever. E D I T O R ' S N O T E D A R R E N B U F O R D , E D I T O R D A R R E N @ A B M P . C O M , @ D A R R E N B U F O R D Body Sense Editor Darren Buford 11% Doesn't matter much. Those who have experienced the benefits of massage firsthand will continue to sing its praises regardless of the scientific literature behind it. 5% Not at all. Massage is a nurturing art, not a scientific approach to health and wellness, and does not need the validation of science. It should be kept separate from clinical health-care techniques. 50% Very important Massage needs scientific validation to gain a place of higher respect in health care. 31% Somewhat important. Some people need to see tangible, repeatable results before they will take massage seriously, while others only need to know whether it works for them.